The Billfish Report is counting down the top billfisheries of 2009 – and coming in at #7 is the US East Coast. We define the US East Coast as far north as the Canyons off New Jersey and as far south as North Carolina’s Outer Banks. Given that the migration patterns of so many of the billfish seen on the East Coast are similar – and that evidence has it that many of these fish are the same fish caught up and down the coast off similar structure – this fishery tends to have good variety of fish, often coming in waves, with a season that runs almost half the year for billfish. And 2009 was one incredible year for the East Coast – be it the record white marlin run off Virginia Beach and the Outer Banks in September, or the consistent swordfish bite off New Jersey, or the waves of sailfish seen up and down the coast. This variety of billfish, the intermittent size of fish, along with some incredible runs of huge numbers of billfish has proven the reputation of the US East Coast as one of the best billfisheries on the planet. 2009 certainly saw proof of that. – The white marlin run. Almost unprecedented, what Virginia Beach saw in September was truly out of this world. 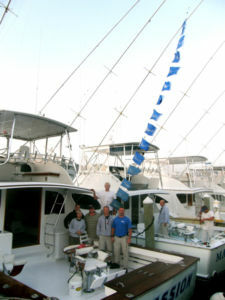 For example…on September 24, the fleet caught over 400 white marlin – with some blues mixed in. The next days saw boats catching as many as 41 white marlin a day – double-digit days abounded…and the fish were kind enough to move down to NC shortly thereafter. – A very long season this year. Billfish were seen – starting with a spearfish off NC in April, ending with a December blue marlin off Oregon Inlet – in nine of this year’s 12 months. Remarkable! – Incredible variety of fish yet again this year, with every Atlantic billfish species – spearfish, white marlin, blue marlin, Atlantic sailfish, and swordfish – all being caught here. Only Venezuela can match the consistent variety of fish this billfishery sees. So the US East Coast is the Billfish Report’s #7 Billfishery of the Year. Stay tuned for #6, coming next week! Why do consider the east coast only up to New Jersey. We have plenty of great marlin fishing here in Massachusetts. White, Blues, and Swords. Last year was a great year for the Blues as we just about raised one every trip out. Nantucket has long been known for its White Marlin fishery. At night we get at least 2 bites a night on the Swordfish. I know of 6 confirmed longbilled spearfish caught in our canyons last year. Check out the website of the charter boat I mate aboard, you will not be disappointed. Great Website and keep up the good work! John – I’ll plead ignorant for now, that is some pretty good fishing. We’ll definitely check it out next season.